Most of the elements are found within compounds. Water and minerals are inorganic compounds. Organic compounds include fat, protein, carbohydrates, and nucleic acids. Water: Water is the most abundant chemical compound in living human cells, accounting for 65 percent to 90 percent of each cell. It’s also present between cells. For example, blood and cerebrospinal fluid are mostly water. Fat: The percentage of fat varies from person to person, but even an obese person has more water than fat. Protein: In a lean male, the percentages of protein and water are comparable. It’s about 16 percent by mass. Muscles, including the heart, contain a lot of muscle. Hair and fingernails are protein. Skin contains a large amount of protein, too. Minerals: Minerals account for about 6 percent of the body. They include salts and metals. Common minerals include sodium, chlorine, calcium, potassium, and iron. Carbohydrates: Although humans use the sugar glucose as an energy source, there isn’t that much of it free in the bloodstream at any given time. Sugar and other carbohydrates only account for about 1% of body mass. 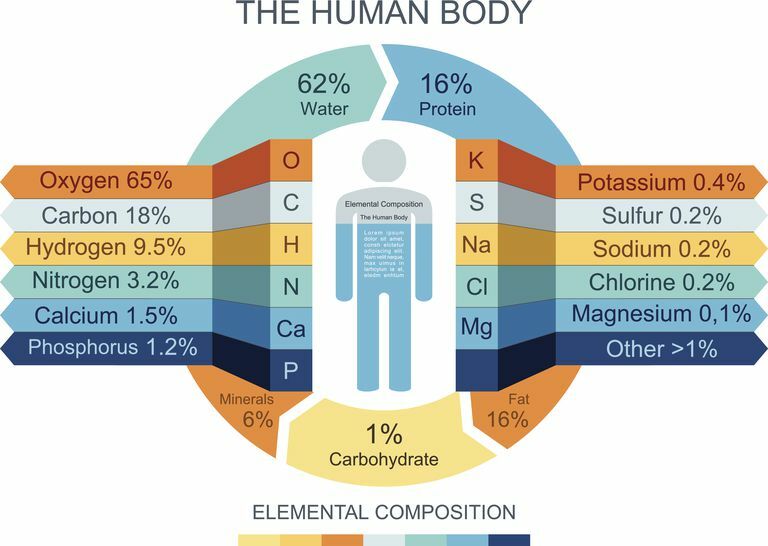 Six elements account for 99% of the mass of the human body. The acronym CHNOPS may be used to help remember the six key chemical elements that are used in biological molecules. C is carbon, H is hydrogen, N is nitrogen, O is oxygen, P is phosphorus, and S is sulfur. While the acronym is a good way to remember the identities of the elements, it doesn’t reflect their abundance. Oxygen is the most abundant element in the human body accounting for approximately 65% of a person’s mass. Each water molecule consists of two hydrogen atoms bonded to one oxygen atom, but the mass of each oxygen atom is much higher than the combined mass of the hydrogen. In addition to being a component of water, oxygen is essential for cellular respiration. Carbon is contained in all organic compounds, which is why carbon is the second most abundant element in the body, accounting for about 18% of body mass. Carbon is found in proteins, carbohydrates, lipids, and nucleic acids. It’s also found in carbon dioxide. Hydrogen atoms are the most numerous type of atom in a human, but because they are so light, they only make up around 10% of the mass. Hydrogen is in water, plus it’s an important electron carrier. Nitrogen is about 3.3% of body mass. It’s found in proteins and nucleic acids. Calcium accounts for 1.5% of body mass. It’s used to build bones and teeth, plus it’s important for muscle contraction. Phosphorus is about 1% of body mass. This element is found in nucleic acids. Breaking bonds connecting phosphate molecules is a major component of energy transfer. Potassium is around 0.2-0.4% of the mass of a person. It’s used in nerve conduction. Potassium is a key cation or positively-charged ion in the body. Sulfur is found in some amino acids and proteins. It’s about 0.2-0.3% of body mass. Sodium, like potassium, is a positively-charged ion. It’s about 0.1-0.2% of body mass. Sodium helps regulate the electrolyte balance in the body and maintain homeostasis with respect to the volume of water in the blood and cells. Although aluminum and silicon are abundant in the earth’s crust, they are found in trace amounts in the human body. Other trace elements include metals, which are often cofactors for enzymes. Trace elements include iron, cobalt, zinc, iodine, selenium, and flourine.